Larry Eugene Mann was executed on April 10, 2013, by the state of Texas. Larry was pronounced dead at 7:19 pm EDT, inside the execution chamber at the Florida State Penitentiary near Raiford, Florida. Larry was 59 years of age. 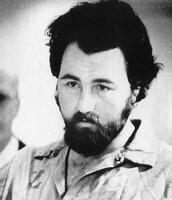 He was executed for the murder of 10-year-old Elisa Nelson on November 4, 1980, in Palm Harbor, Florida. Elisa was kidnapped and killed while riding her bike to school after a dentist appointment. The day of Elisa’s death, Larry attempted to commit suicide. Larry had a history of pedophilia, depression, and substance abuse. He had attempted to commit suicide at least three times prior to murdering Elisa. He had previously served time for sexual battery. Please pray for peace and healing for the family Elisa Nelson and all others who have been touched by his crimes. Please pray for the family of Larry. His last words, which were written and handed out after the execution, included a bible verse, Romans 6:23.